Last Friday, Christie’s in London was having “the 50 years of James Bond” auction, where Bond fans could bid on officially used items in the famous 007 movies. We are – of course – especially interested in the watches that Bond wore in his movies. In Skyfall, 007 is again wearing an OMEGA Seamaster on his wrists. Both an Aqua Terra and a Planet Ocean, two sub collections of the famous Seamaster series. The Planet Ocean that Daniel Craig wore during the movie shoot, has been auctioned for the stunning amount of £157,250 GBP ( $254,273 USD / CHF 236,473). There was a lot of rumor and gossip around this watch, as OMEGA kept it quiet for a long time which watch would be used in Skyfall. After it appeared in the Christie’s catalog for the “50 years of James Bond” auction, a number of James Bond and watch experts were confused about the material used for this watch. The Seamaster Planet Ocean watch used in Skyfall is in Titanium, while Omega promotes the Seamaster Planet Ocean (as the one that will be featured in Skyfall) in stainless steel, ref. 232.30.42.21.01.001 (click here for the official page). 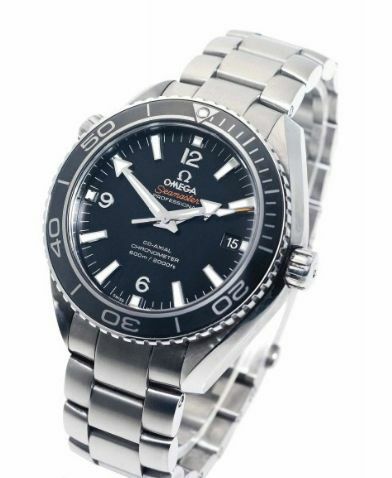 Christie’s mentions on their website that this Seamaster Planet Ocean is “a unique piece specially made in Titanium for action scenes in Skyfall“. Well, that’s that. I am curious if Omega is going to release a Titanium version of this model in the near future in order to give James Bond fans the opportunity to own the exact same watch as used in Skyfall. We’ll see. Anyway, the whole amount is going to be donated to the ORBIS International project, support by Daniel Craig. 1. OMEGA Seamaster Planet Ocean in Casino Royale, auctioned during Antiquorum’s OMEGAMania in 2007, fetched CHF 250,250. 2. OMEGA Seamaster Planet Ocean in Skyfall, auctioned by Christie’s in London (2012), fetched CHF 236,473. 3. Rolex Oyster Perpetual Submariner in Live and Let Die, auctioned by Christie’s in Geneva (2011), fetched CHF 219,000. If you want to discuss watches worn by James Bond, make sure to join the James Bond Watches Facebook group, click here. Thanks to JG for some valuable input.